Part 1 Biofilms in the food and beverage industries: Biofilms in the food and beverage industries: An introduction; Molecular mechanisms involved in biofilm formation by food-associated bacteria; Methods for imaging and quantifying the structure of biofilms in food processing and other environments; Monitoring of biofilms in the food and beverage industries; A centralized database for use in studying bacterial biofilms and quorum sensing in food processing and other environments: MicroBQs. Part 2 Microorganisms and their metabolites in biofilms: Biofilm formation by food spoilage microorganisms in food processing environments; Biofilm formation by Listeria monocytogenes and transfer to foods; Biofilm formation by Salmonella in food processing environments; Biofilm formation by Gram-positive bacteria including Staphylococcus aureus, Mycobacterium avium and Enterococcus spp in food processing environments; Biofilm formation by spore-forming bacteria in food processing environments. Part 3 Biofilm prevention, inactivation and removal and beneficial biofilms: Food contact surfaces, surface soiling and biofilm formation; Cleaning and sanitation in food processing environments for the prevention of biofilm formation and biofilm removal; Novel methods for biofilm control and removal from food processing equipment. Part 4 Biofilms in particular food industry sectors: Biofilms in red meat processing; Biofilms in dairy processing; Biofilms and brewing; Biofilms in poultry processing; Beneficial biofilms: Wastewater and other industrial applications; Biofilms in fish processing; Biofilms in fresh fruit and vegetables. Part 5 Appendix: Sampling and quantification of biofilms in food processing and other environments. When bacteria attach to and colonise the surfaces of food processing equipment and foods products themselves, there is a risk that biofilms may form. Human pathogens in biofilms can be harder to remove than free microorganisms and may therefore pose a more significant food safety risk. Biofilms in the food and beverage industries reviews the formation of biofilms in these sectors and best practices for their control. The first part of the book considers fundamental aspects such as molecular mechanisms of biofilm formation by food-associated bacteria and methods for biofilm imaging, quantification and monitoring. Part two then reviews biofilm formation by different microorganisms. Chapters in Part three focus on significant issues related to biofilm prevention and removal. Contributions on biofilms in particular food industry sectors, such as dairy and red meat processing and fresh produce, complete the collection. 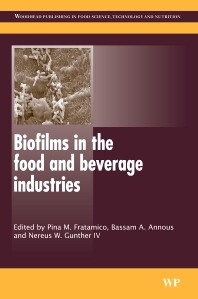 With its distinguished editors and international team of contributors, Biofilms in the food and beverage industries is a highly beneficial reference for microbiologists and those in industry responsible for food safety. Pina Fratamico is a Research Microbiologist at the US Department of Agriculture’s Agricultural Research Service. Bassam Annous is a microbiologist in the Microbial Food Safety Research and Food Safety Intervention Technologies Research Units, respectively, at the US Department of Agriculture, Agricultural Research Service. Nereus Gunther is a molecular biologist in the same organisation’s Microbial Food Safety Research Unit.